Mega Man Battle & Chase (ロックマン バトル&チェイス, Rokkuman Batoru ando Cheisu?, lit. 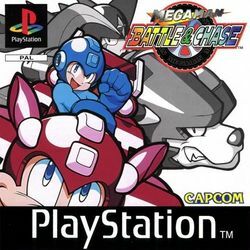 Rockman Battle & Chase) is a PlayStation racing game based on the original Mega Man series from Capcom. The game was released in Japan in 1997 and in PAL territories in 1998, but was never released by itself in North America. The game is included along with the first six Mega Man X games in the Mega Man X Collection for the PlayStation 2 and GameCube. Mega Man Battle & Chase is the very first 3D Mega Man title. Each of the game's 10 playable characters has unique abilities, and can earn the abilities of other characters by winning races against them, then selecting their vehicle's engine, wing, tire, or body as a prize (the body is only available after collecting all other parts from a character). The tracks' colorful graphics and road hazards, as well as the special items which can be collected and the unique personalities of each character, are reminiscent of the Mario Kart series, but gameplay differs in that characters can fire a projectile at any time, whether or not they have a special item, if their weapons are fully charged. Choosing which parts to take from defeated opponents is also an important strategy, as many races are much easier with the proper parts. This page was last edited on 2 July 2014, at 12:49.